We hadn't planned on going out today, but this morning we both had the itch to get out of the house and make something of the day. Plan of attack? 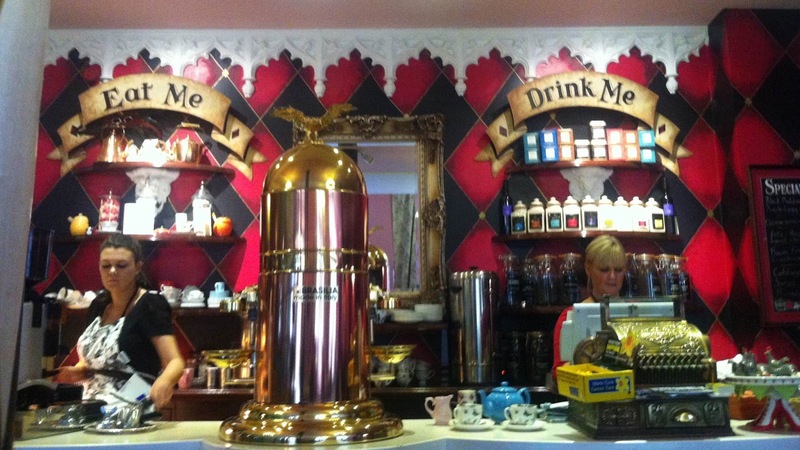 Richmond Tea Rooms in Manchester. I'd heard good things about this place on Twitter (thank you @keveh, @adamcrolla, @hansyquirk and @guapette78!) so had it on my ever increasing 'To Do' list. Moment seized, we trotted off with high expectations of somewhere so widely recommended. I knew it was in the Village area, but had never stumbled across it before. The directions took us down a rather dark and dingy back street which smelled a little of the 'night before'. I was convinced we were lost. And there it was. A little oasis of Tête-à-Tête daffodils in window boxes. Now I know what Alice felt like. It's like jumping into another world! Walking into the dining room from that back street can only be likened to Lucy's first glimpse past the fur coats. There was no Mr Tumnus, nor a tardy white rabbit. Instead, you are greeted by a sea of lace, floral curtains, a giant urn with an eagle on it and two huge signs demanding 'Eat Me' and 'Drink Me'. I was so aghast that I nearly didn't notice the huge cake display cabinet! Really! 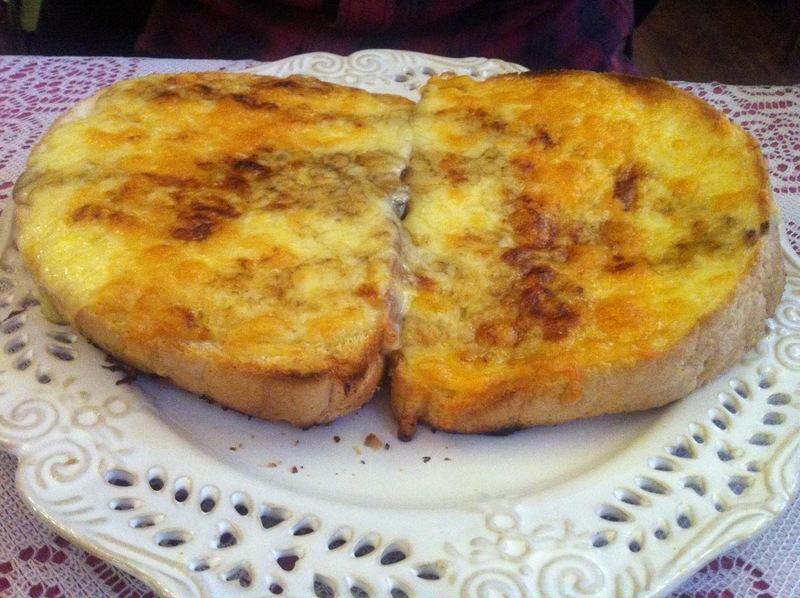 I opted for a a stack of pancakes with lemon and sugar, and my husband had Welsh Rarebit. Both of these dishes are amongst our personal favourites, so the pressure was on. I have a simple test when it comes to pancakes. Do they come with enough lemon juice and sugar, and is it in the correct quantity? I often find that there is a sniff of sugar and only a slither of lemon. I want enough sugar to rot every tooth in my head. 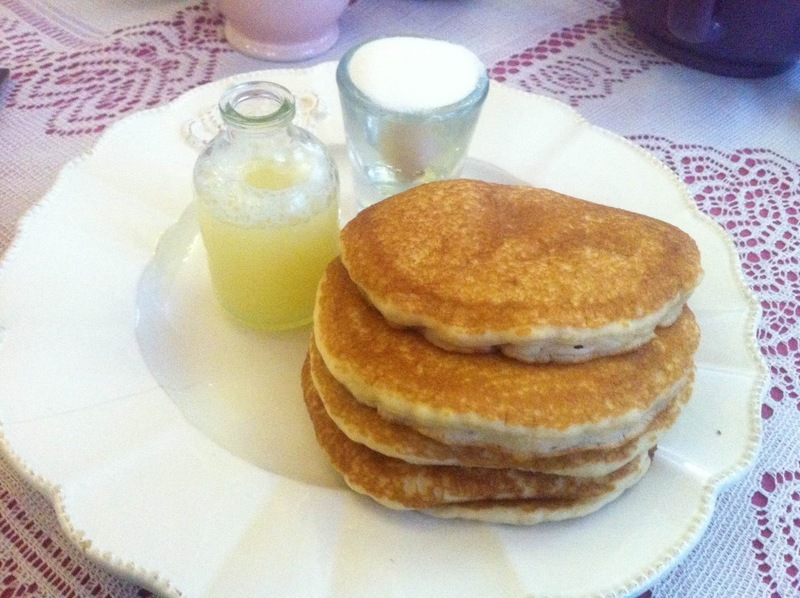 The pancakes were the thick American variety and came with a miniature bottle of lemon juice and a shot glass of sugar. Plenty of both! I'm afraid I had to leave one of the pancakes, but only because I was sure I would die before dessert if I ate it. 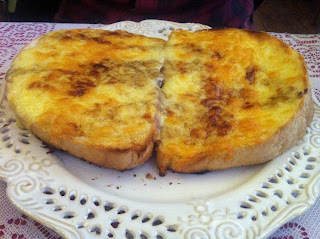 My husband still talks of the legendary Welsh Rarebit he had at St John's in London over the summer. I'm fairly confident nothing will ever top this. Richmond Tea Rooms serve theirs on doorstep toast, and has that rich mustardy tang I think he's been craving. It was reassuringly stodgy, with a healthy glug of Worcester sauce. Lovely. I couldn't wait for dessert. 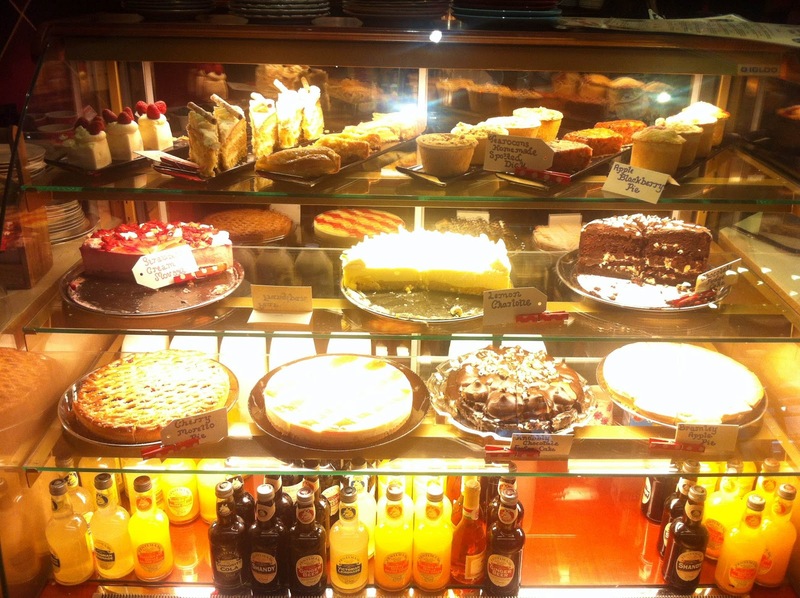 I'd seen the magnificent cake cabinet whilst waiting to be seated, and had my eyes on the prize... 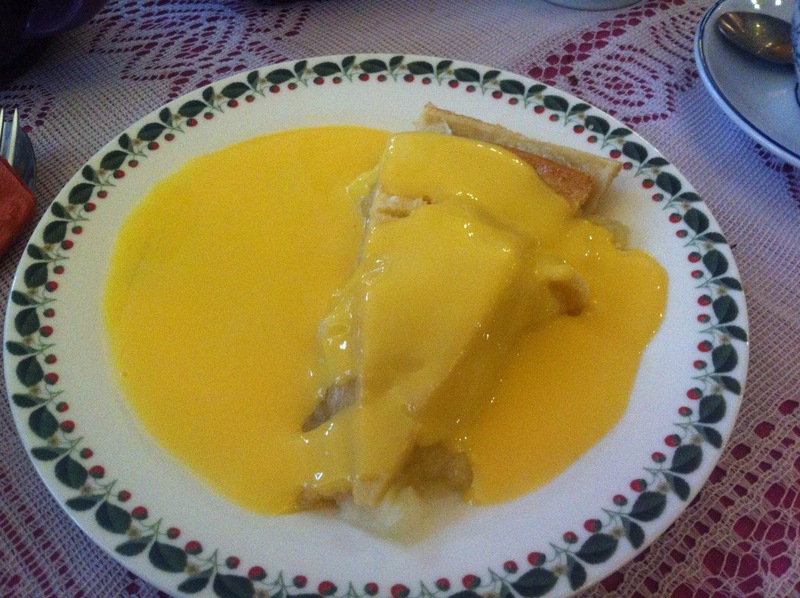 I had a white chocolate box filled with raspberry coulis and my husband had apple pie with custard. Trust me. You need this in your life. No review would be complete without mentioning the tea. We shared a pot of the house 'Richmond' blend, which was perfect. I like my tea strong and dark, and this ticked both boxes. Lovely stuff. Richmond Tea Rooms was a pleasant afternoon out, and somewhere I would like to go again. 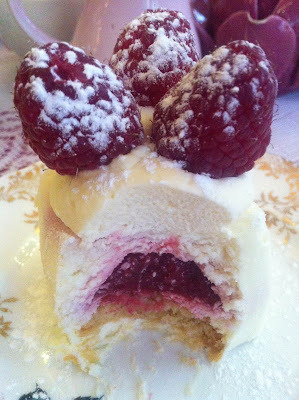 For tea, two main courses and two desserts, we spent just under £25. 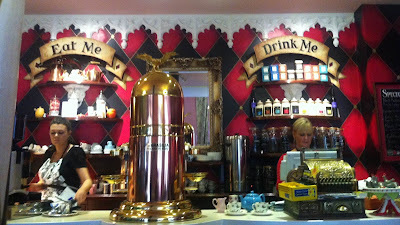 For more information visit their website at: Richmond Tea Rooms. Disclaimer: I went to Richmond Tea Rooms because it was recommended by half of Twitter, and I wanted cake. 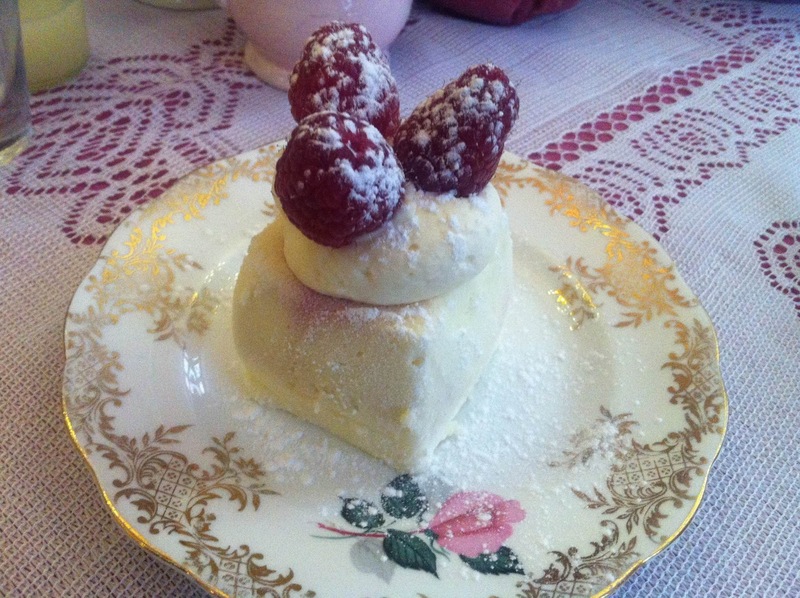 They did not know I was going to review the tea rooms and did not pay me for doing so. Lovely place to eat. I've been a few times and its definitely someplace I must visit when I'm in the area. great food and service.